We have put together two great events for those who want to experience two fascinating cultures on a superb 14-night Grand Tour. 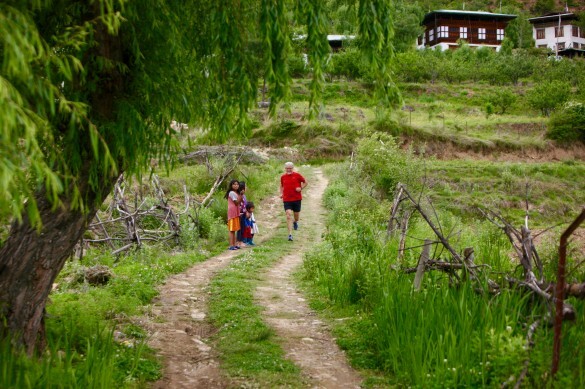 Run the Great Wall Marathon or Half Marathon then fly on to the mystical Himalayan Kingdom of Bhutan for the Thunder Dragon Marathon and Half Marathon- truly the trip of a lifetime. The Grand Tour highlights our 6-night Great Wall package, with 4 nights in Beijing and 2 nights in the provincial town of Jinxian located close to the section of the Wall hosting the race. Stay and enjoy the Celebration Banquet the day after the Great Wall Marathon then on the Monday fly to Bangkok, the gateway city for flights to Paro in Bhutan. The 6-night package in Bhutan includes visits to the Tigers Nest Monestary, the capital Thimphu and the old capital of Bhutan Punakha, with cultural visits and day treks built in. 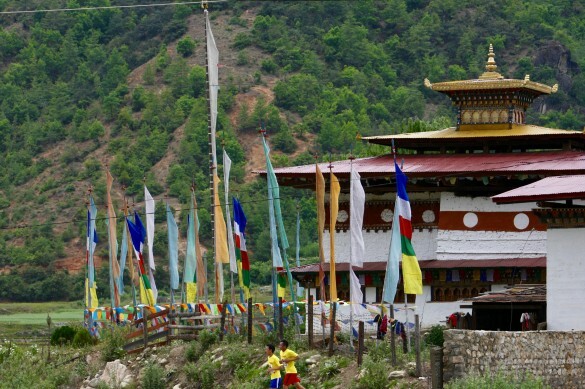 The Thunder Dragon Marathon runs along the beautiful Paro River and one of its tributaries and takes in Paro Dzong, with the half marathon also running across the famous ornate bridge which leads to the impressive main gate of the Dzong, where the half and full marathons join together again for the last 10km. The amount of climbing is moderate at 1,000m of altitude gain and loss in the marathon and 450m in the half with the two longest climbs of approx 4km (one in the first half and one in the second half) on road and farm tracks - the lowest point is at 2,200mts and the highest 2,560mts. You will need to purchase flights from your home to Beijing, then on to Bangkok to join the Thunder Dragon part of the tour. The return flights Bangkok/Paro (Bhutan)/Bangkok are included in the package. You will also require an overnight at least on the inbound in Bangkok as flights to Bhutan leave early in the morning. Flights return to Bangkok at the end of the tour in the late afternoon so you should be okay for a late evening onward flight or stay overnight in Bangkok again. The Radisson Blu Beijing hotel lies near the city’s commercial and diplomatic centers and sits adjacent to the China International Exhibition Center (CIEC) with direct access by gate 6. Guests can also easily reach the NCIEC, and the Beijing International Airport is only a 30-minute drive away. All visitors will enjoy the hotel’s proximity to historical sites, such as the Forbidden City and Great Wall, and the comforts and amenities offered by its 360 rooms and suites, like 24-hour room service. Three on-site restaurants offer diners a variety of culinary options, while the hotel bar serves tasty snacks along with beer, wine and cocktails. This Beijing hotel offers many other services including a fitness center with indoor pool, off-site catering, a staffed business corner and a beautiful indoor/outdoor event space. Designed in Spanish style, 20 minutes’ drive from Jixian Railway Station, Tianjin Eagle Land International Hotel is a 5-star accommodation located in Tianjin. Situated in the north of Yanshan Mountains, the property is next to Cuiping Lake. There are several popular attractions around this property, such as Panshan Mountain, Huangya Pass and the Eastern Qing Dynasty Tombs. This property features guest rooms with mountain and lake views. Guests can relax in the hot tub, swim in the indoor pool and play golf. Free Wi-Fi is available in all areas. Tianjin Eagle Land International Hotel is a 20-minute drive from Dule Temple, a 30-minute drive from Mt. Panshan Scenic Area and a 40-minute drive from Eastern Qing Dynasty Tombs. The nearest airport is Beijing Capital International Airport, 80 minutes’ car journey away. Featuring a private balcony with stunning views, each room comes with a minibar, a flat-screen satellite TV, an in-room safe, an iron and a seating area with sofa. A bathtub, shower facilities and soft bathrobes are included in the en-suite bathroom. All sorts of guest services are provided at the property including room service, car rentals, concierge service and daily maid service. Business facilities are available for those who want to hold conventions and meetings. By simply sitting on the sun terrace and enjoying the beautiful views, guests can surely feel relaxed. Guests can enjoy western, Cantonese, Hunan and local cuisines in the 2 on-site restaurants. We will use two main hotels both at or a few hundred metres from the start and finish. The hotels will be allocated depending on numbers booked for each option - this way we can keep clients booked on the same option together throughout their time in Bhutan. The resort has 10 rooms at the main block and 5 cozy villas with 4 rooms in each villa, which are all deluxe twin bedded rooms decorated in a traditional style with modern facilities like security boxes, TV and free wireless internet connection. Pakshing Bar made wholly of bamboo which serves only local drinks and a handicraft shop with all the antiques on display just next to the bar in the main block will surely mesmerize you. To add to the natural beauty of the resort, a traditional bridge is constructed which passes over a small brook. The resort is a blend of traditional look with a touch of modern architecture. Raven's Nest Resort has 21 guest rooms with en suite bathroom, private balcony, 42-inch cable LCD TV with premium channels, kitchenette, refrigerator, working desk and space heating. Bathroom amenities include shower and tub combination and rainfall showerheads. Each room is provided with bathrobes, hair dryers, slipper, hair dryers irons and ironing boards and adequate complimentary toiletries. All rooms are provided with complimentary bottled water and coffee or tea makers. If these hotel fill we will use other hotels of similar standard in the close vicinty of the start/finish. Mon 13 May: Departure from UK to Beijing (International fights are not included). You will need to purchase flights from your home to Beijing, then on to Bangkok to join the Thunder Dragon part of the tour. The return flights Bangkok/Paro (Bhutan)/Bangkok are included in the package. You will also require an overnight at least on the inbound in Bangkok as flights are early morning. Flights return to Bangkok at the end of the tour in the late afternoon so you should be okay for a late evening onward flight or you can stay overnight in Bangkok again. On arrival in Beijing you will be met by a local English speaking guide who will supervise the transfer to your hotel in Beijing, the 4-star Radisson Blu Beijing. Transfer time approx 30 mins depending on traffic. It may not be possible to check into your room for early morning arrivals but you will be able to leave luggage safely with the front desk until such time as your room is ready. Full day excursion included today including a visit to the Forbidden City, Temple of Heaven and the Silk Exhibition Hall. Lunch included. 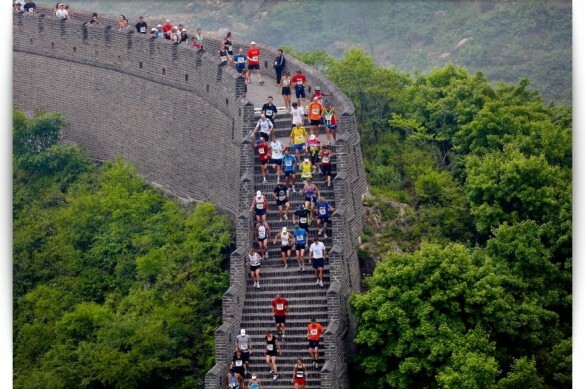 Leave your hotel at 6.45am for the 3-hour drive by coach to the section of the Great Wall used for the race. Assemble in Ying & Yang Square for the briefing followed by a chance to walk part of the 'Marathon' section of the Wall. Once you have walked back to Ying and Yang Square pick up a lunch box and relax. After the race inspection transfer to your hotel, the 4-star Eagle Land Hotel in the Provincial town of Jixian for a 2-night stay,. Time to discover Jixian independently - the main square is fascinating in the evening with large groups performing traditional Chinese dance. The day is at leisure in Jixian and you may like to book on to the Optional Excursion Tour 1 visiting a local out door market and the historic Qing Tombs with Chinese lunch included. Pasta Party in the evening. Breakfast and Dinner (lunch if on Optional Tour 1) included. Depart from your hotel at 5.30am for the coach drive to the race base at Ying & Yang Square. After the races collect your lunch box then transfer back to the Radisson Blue in Beijing. Evening at leisure. Optional Excursion 3: Summer Palace, Giant Panda and Pearl Exhibition Hall - lunch inluded. Breakfast and Dinner Included (lunch on optional excursions). After breakfast this morning transfer to Beijing Airport for your flight to Bangkok. Overnight stay is required in Bangkok - we recommend the Airport Novotel at BKK Airport. The flight from Beijing to Bangkok is not included. TUESDAY 21 MAY: Arrival Paro (included flight). Drive to Punakha via Dochu La Pass (approx 2 1/2hrs). Afternoon sightseeing in Punakha; visit the Devine Mad Monks Temple (Temple of Fertility) and the remarkable Punakha Dzong, past home to the King of Bhutan. Overnight Punakha. Lunch, Dinner. WEDNESDAY 22 MAY: Today we start our acclimatisation activity with a hike to Soela Gompa via Khamsum Yuelley Namgyel Chorten. This hike is approx 15km at moderate difficulty but strenuous in places near the top of a 6km climb, and will take around 8hrs. Overnight in Punakha. Breakfast, Lunch, Dinner. FRIDAY 24MAY: Hike to Taktshang Monastery (Tigers Nest) 6hrs. On the way back visit Drukgyel Dzong and Kichu Lhakhang Monestary. Overnight Paro. Breakfast, Lunch and Dinner. SATURDAY 25 MAY: Free time for shopping in Paro. Race day briefing. Breakfast, Lunch and Dinner. Overnight in Paro. Mon 27 May: Fly out to Bangkok Breakfast (10.15am departure, arriving at 3.45pm).